This family-friendly casserole is ready in less than an hour. 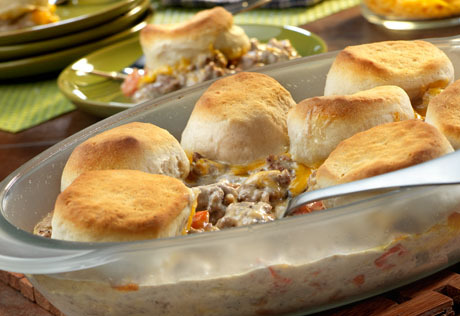 Ground beef, creamy pasta sauce and tomatoes are topped with buttermilk biscuits and baked to golden brown deliciousness. Cook the beef in a 12-inch skillet over medium-high heat, stirring often to separate meat. Pour off any fat. Stir in the sauce, tomato and Worcestershire and heat to a boil. Reduce the heat to low. Cook for 5 minutes. Spoon the beef mixture into a 1 1/2-quart casserole. Sprinkle with the cheese, if desired. Arrange the biscuits on the beef mixture. Bake for 10 minutes or until the biscuits are golden brown.